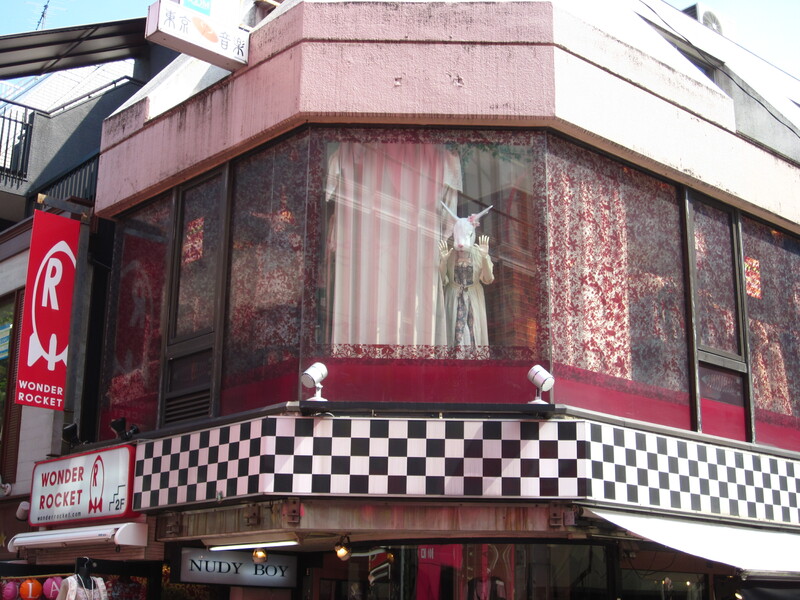 My first day in Tokyo was spent doing my favorite thing to do in Tokyo – browse around the street fashion shops in Harajuku. Any store that looked like a band I might listen to was explored. One shop was playing my all-time favorite album, Vidoll’s V.I.D., so they ended up luring me in and getting my business. Body Line was full of bratty kids who stood around begging their parents for money for clothes they would scarcely be able to wear in a normal social setting. One shop tucked away in a basement had an outfit worn by a rather popular band on display – unfortunately photos were not allowed. She proceeded to try her very best to get me to buy something, but I just didn’t have the money – everything she had was custom made and around 10,000 yen. Her being a rather pushy lady, I had to find an excuse to leave. That came in the form of a young man who strolled in. Apparently he knew the woman, though I couldn’t tell whether they knew each other through the shop or through something else. The woman started bantering with the kid right away. “Did you go to school today? What are you now, a middle schooler? You started a band!? Who would listen to you?” While I found their conversation quite amusing, I knew that was my only opening. I strolled back out onto the hot streets and concluded my browsing. After Harajuku, there was one thing I wanted to do during my final trip to Tokyo. There was a cafe called Edelstein which was in the same vein as maid cafes. Rather than maids, however, it was staffed by young men dressed in private school uniforms. Unfortunately I came to find out that the place had closed down earlier this year. When sharing my woes about this on facebook one of my friends suggested a special maid cafe. Called New Type, it is staffed entirely by men. Yes, I said maid cafe – no, I don’t mean butler cafe. Everyone working there was lovely, and some of them were rather convincing as women. Compared to maids, however, I found these guys to be more friendly and genuine. Instead of wearing a false smile the entire time, they would joke around with each other and customers, engage people in random conversation, simply doing things that seemed less robotic than the typical service worker in Akihabara. I suppose that’s part of the draw to this place – the number of men and women in the place was equal – maybe it’s because these kinds of maids had a different feel than all the others. After a while I started talking with the businessman sitting next to me. He says he goes to the place every week, Thursday, though that week he went on Wednesday. He is an accountant originally from Osaka, now living in Tokyo. I wanted to ask him what drew him to New Type, but I figured that might be rude. Instead I asked him what I should do for my last day. At a loss, he asked one of the maids. He gave it quite a bit of thought before finally suggesting I go visit Odaiba. So that’s what I did. The last time I was in Tokyo, I remember wanting to go to Odaiba but not getting the chance. Odaiba is a man-made island sitting out in Tokyo Bay. Everything on the place has a futuristic feel to it. 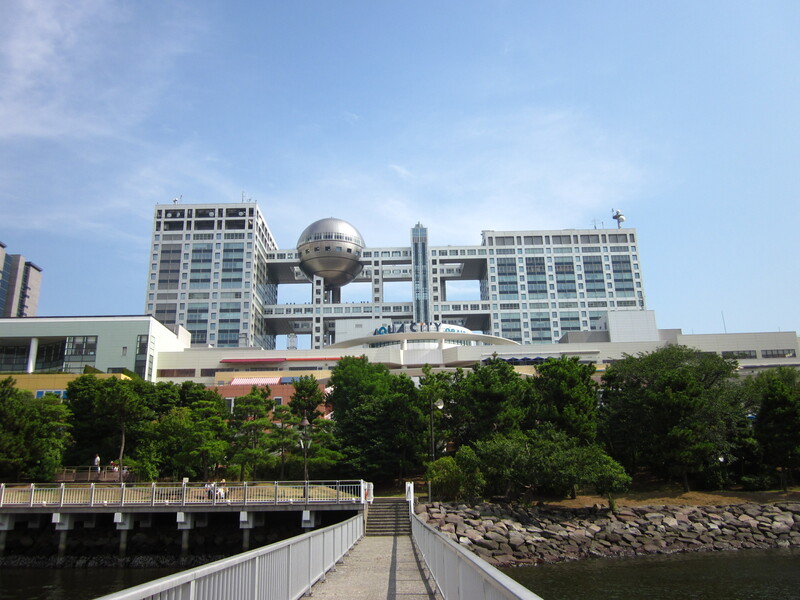 The most famous landmark is the Fuji Television building, with a giant sphere sitting in the middle of it for no apparent reason. Today it was jam-packed with tourists, almost all Japanese, sitting on the shade of the massive staircase in hopes of warding off the heat as they ate vendor food. While wandering about the area around Fuji Television I remembered something. In the story arc in which the children returned back to Earth, the kids from Digimon spent their entire time in Odaiba. It was where their apartment was, it was where Greymon destroyed a bridge, and Fuji Television was where one of the most epic battles in the series took place. With that one, nerdy realization I felt like I was reliving my childhood. If it weren’t for the heat I might have explored the area more, but it was too much for me. Watching that sphere atop Fuji Television as I walked away, I made my way back to mainland Tokyo. What will it be like to be back in the country where I was born? No, this post is not about one-night stands. If you’ve been paying attention you know what’s coming – a post highlighting visit number two to a host club. I took a highway bus out of Hiroshima without thinking. Since it’s currently Obon season, everyone is traveling back to their hometowns. This makes for full buses and awful traffic. Getting out of Hiroshima city took over an hour. Getting from Kobe to Osaka took probably more than an hour. As everyone I knew in Hiroshima has started to go home or travel in their summer vacation, I didn’t have many people I could text with. It turned out my only text message company on the bus was the host I’d chosen last time I was in Osaka. It was about 8 p.m. by the time I finally arrived in my air conditioning-less hostel. After a shower and a quick convenience store meal I was convinced, with the help of my host, that I needed nothing more than a drink. Off to Soemon-cho I went in order to see what a second trip to one of Osaka’s famous host clubs would be like. The club I’d been to before had apparently split into several others. Since the location had changed, my host called me and asked where I was so that he could come pick me up. It didn’t take long for him to find me. 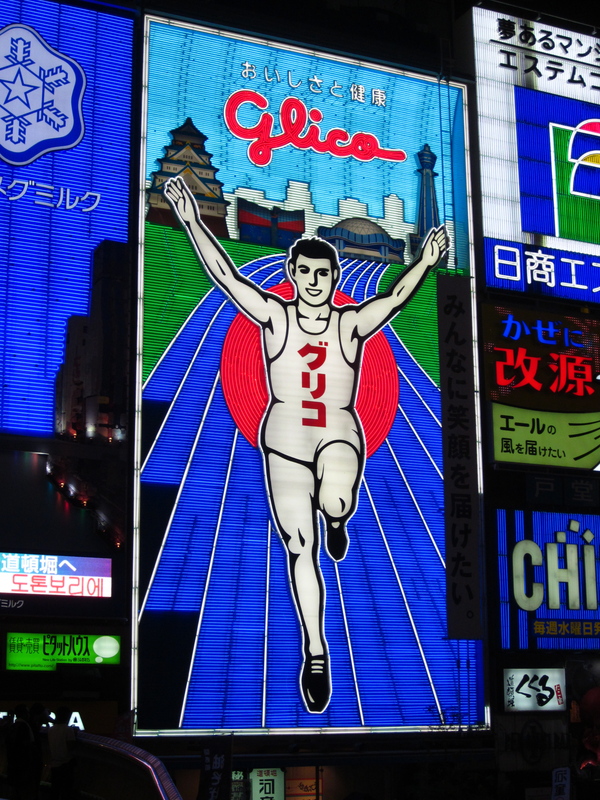 I was standing in front of Osaka’s iconic neon Glico sign, and finding a foreigner in a crowd isn’t exactly difficult. I’m a bit surprised I didn’t get approached by any other hosts. There were a group of them trawling for customers at the end of the bridge. Maybe they feared they would have to use the Dreaded English. It was rather early when I arrived, at least by host club standards. It was a bit awkward being the first customer in the place. Immediately I was given a seat along with my host, who sat closer this time than any of them had on my first visit. What really shocked me was that several of the hosts came by and called me by name, asking if I remembered them. Of course I did, though maybe not by name. Even so, it was hard for me to believe they could remember so much about me after so many customers. Maybe it’s because I’m a foreigner, or maybe they learn to keep names and useless facts locked away. It’s hard to say which. Though the club was new, since many of the hosts were the same and the owner was technically the same, I was treated as a returning customer. This is what I wanted, of course, in everything expect for the price. The initial two hour all-you-can-drink was upped by 2000 yen. 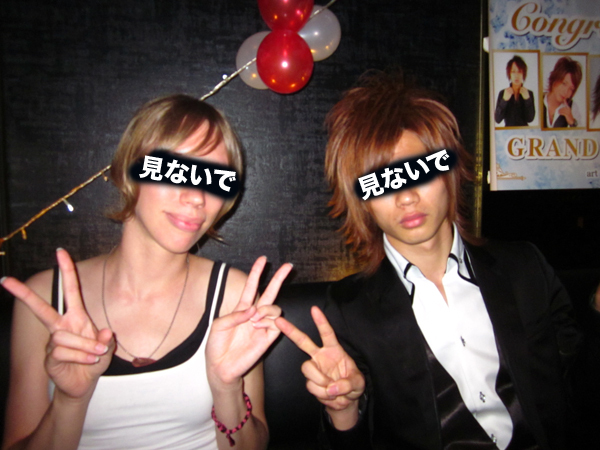 I was also asked by several hosts if they could drink with me – allowing them to drink would cost another 1000 yen. I said I only had a set amount of money, so after allowing my host to get a beer, he told off any host who bothered me after that. Though I’d heard some nasty things about hosts tricking customers out of their money, I found they were really honest about the price. When I asked how much additional time and whatnot would cost, they were careful to calculate it twice for me. I also found out that saying a host club is expensive to your host is pretty rude. I suppose this should be common sense, but it’s one of those things that just slips out. Of course they accepted my comment with a smile, but I was chided in good humor for quite some time after the comment. The system this time worked like this: whenever he was available, my host would be there speaking with me. Other hosts with free time would come over occasionally and chat with us. Through which hosts went to which customers at which times it became immediately obvious who the high paying customers were. Three women came in at one point and took the attention of almost all of the staff, my host included. I was left with the most amateur host. At one point a woman came in with three men I was told were high up in the chain of people-involved-with-running-host-clubs and there was another large exodus to make sure they were served well. I, on the other hand, being someone who had already expressed having a limited budget and being someone who was going to be leaving Osaka soon, was waited on by the less popular hosts, at least so far as I could discern. Number one stopped by to ask if I remembered him, but that was the extent of our interaction. Aside from my chosen host I spoke mostly with the newest host and two others who remained mostly unoccupied. This time around, since I spent most of my time with the same guy, the experience was much less like speed dating. What it was more like is hard for me to say. I wouldn’t say it felt like being on a date, exactly, probably since there was usually at least one other guy there with us. It felt more like how I often felt back in Saijo, going to bars and meeting random Japanese guys. We had casual conversations and joked around while drinking. The only real difference was that every now and then my host might put a hand on my leg or something of that nature. Male-female contact of that sort in Japan is extremely rare outside of couples. Which might be a good place to say that perhaps my inability to play into the game comes from a difference in culture. I often hang out with guys and only guys. This is strange to Japanese people – I’ve been told that going out one-on-one, male and female, for things as simple as a cup of coffee during a break, can be seen as a date. To me, with a male best friend back in America, this is a bit hard to fathom. So while I enjoyed the experience as a way to practice Japanese with beautiful men, it’s hard for me to picture it as anything more than that. The hosts do their best to make you feel the fake relationship, however. The youngest host continuously made comments about how close I appeared to be with my chosen host who, like a guy on a second date, responded bashfully every time with, “I only met her the one time.” Every member of the staff is in on this game. Along with this conversation I was reminded of an article I read while in America about host clubs. The author had a very negative opinion of hosts, saying that they were people with no talent and no education. My host said he didn’t complete high school, so maybe in his case there weren’t many well-paying options. The younger one, on the other hand, was a college student with a future ahead of him. I find that an article condemning all hosts in such a way lacks perspective. It’s hard for young people to come by the amount of money a host can make. The temptation to anyone, educated or not, talented or not, isn’t hard to understand. By the end of the night I spent more money than I care to say I spent. The hosts are good at their job of convincing you that you want to stay longer. The hours went by quickly, and by the end of each one I found myself asking how much it would be for just a bit longer. When it finally came time for me to give my wallet a rest one of the hosts told me to have a safe trip back. My chosen host responded with, “She’s here for another two nights. I’m sure we’ll see her again.” I found myself pondering which night I would return, convinced by the conviction with which my host had spoken. Today, however, when I went to the ATM I decided that perhaps I should keep it at that farewell. Yet even if I didn’t fall into the trap of believing a host loves me, I’ve fallen a bit into the trap of thinking they could be a friend. I do have to stop and think, “This is fake,” in order to convince myself money is more important than a few hours with a host. I’m sure if I left Japan without saying anything they wouldn’t care either way, yet somehow I still feel obligated to send a message apologizing for not coming again. It feels the same as it felt to leave my bartender friend in Saijo, only this time I don’t get a free snow cone as a goodbye present. It’s a really strange business these guys run. It brings up all sorts of questions about the way in which people think and the way people live that these sorts of places are possible or even necessary. There are so many aspects of the host club that fascinate me. I do want to write something academic on the subject, but I have no idea which angle to take it from. Goodbye, my dear host. Maybe someday I’ll be back in Osaka, but perhaps, as you said, by then you’ll have a normal job. Tomorrow is my last day in Saijo. I’ve spent all of today cleaning out my room and packing. The walls are now void of the many posters that once filled them and incredibly lonely looking. While I was going through things I realized most objects had a memory. “Look, it’s the bag D-san carried through Hiroshima for me.” “This is the paper clip I linked with my friend on the first day, though we didn’t know whether we’d get along at the time.” “The magazine S and T-kun were in!” Just little things like that – tons of them. I’m actually looking a bit forward to getting out of Saijo, but that’s mostly because I hate this kind of limbo I’m stuck in right now. I’m waiting to say goodbye, and it’s not a very pleasant wait. Tomorrow I’m off to Hiroshima for a night. Then it’s Osaka, then departing from Tokyo! I’m sure I’ll chronicle my adventures from there, so once I get over this hard part I’ll write again. I’m sure you all know this word already, but here’s the Japanese word for farewell: さよなら (sayonara). Unfortunately when I went to Osaka I didn’t have the courage to try this, but today I was provided with the chance. I shot three people from Osaka and slashed another with a samurai sword. All died almost instantly. I saw this video about half a year ago. After seeing it I was immediately inspired to see if this tale about people from Osaka was true. My first victim was a friend of Osaka origin attending school here. Sure enough, he pretended to die upon being “shot”. I tried this several times – he even fell to a sniper’s bullet. My English friend attempted it on another Osaka native working at a local bar. Though he made sure to roll his eyes first, he too succumbed to the invisible bullet. Today the first Osakan friend I referred to invited me to a small party. Three of his friends from Osaka were going to show up. He made sure to remind me that they would do this little trick as well. After the obligatory shot to my friend I got one of the others with another bullet. I waited about an hour before going after the second, who wasn’t expecting it at all. The third knew he was to be my next victim, but he wasn’t suspecting a sword was waiting. They all fell to my assassin’s prowess. So next time you’re in Osaka, try it out. Wasn’t there an Xbox commercial like this? The wind started to get vicious last night while we were playing soccer. By the time we got back from stuffing our faces with parfaits (there goes the exercise) it was even harsher. When I woke up this morning it was to the wind whistling from every which way, knocking on my door from the hallway and sending bicycles and tree branches flying outside my balcony. I drifted in and out of sleep for much of the morning thinking about how much I didn’t want to venture down the hill in that kind of weather when my phone buzzed. It was a message from one of my fellow exchange students informing everyone that since trains had been shut down due to the typhoon, all classes were cancelled. With Monday having been a holiday, a typhoon taking out Tuesday, and no classes on Wednesday, it feels like Golden Week all over again. Not long after I’d finally dragged myself out of bed I got a phone call from one of my more adventurous friends. “Want to go to Kagamiyama?” he asked enthusiastically. At first I thought he meant the park with that name, but it was soon clear he meant the “yama” part of the word. We were soon ascending up the path to the top of the mountain as the wind whipped us about. From the top the view was stunning as always and the wind felt awfully nice compared to the stifling humidity that has been bogging us down lately. I sat down on the same bench I had with that freshman several months ago and pondered various things while staring out at the scenery of Shitami, Higashi-Hiroshima and Saijo cities with all the farmland in between. That kind of view and that kind of memory make a lovely combination for typhoon day pondering. Not that anything particular came out of my brain’s activities. As I said, the view was spectacular, and on the way down we stopped to view one of the most beautiful shrines I’ve seen during my stay. I only had my cell phone camera, so I’m thinking I’ll have to make another trip with a real camera, maybe not during a typhoon. 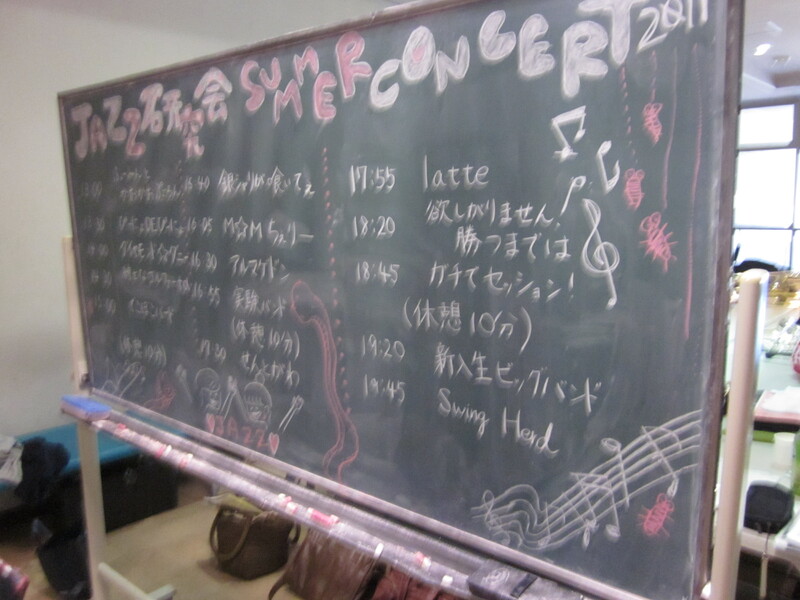 Yesterday was a summer concert held by the jazz circle. 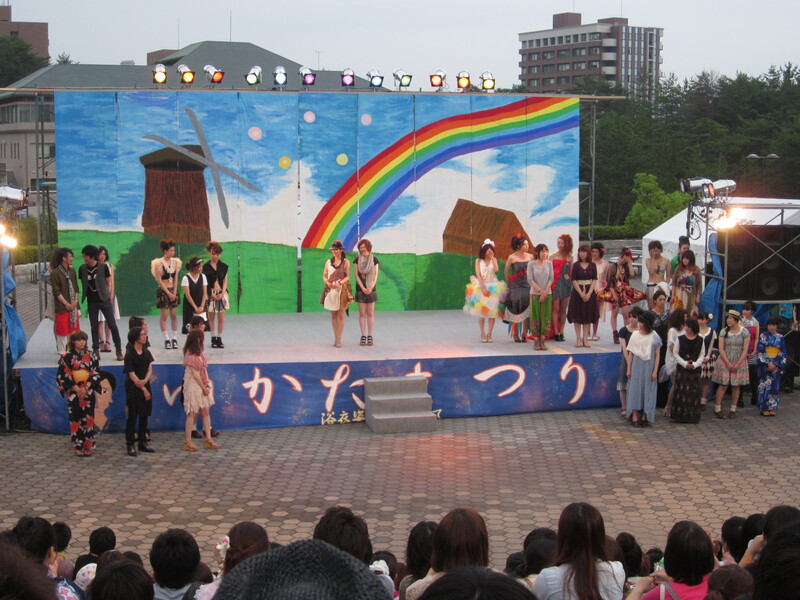 Our group appeared in the performance. As it turns out, it’s the last performance for both our vocalist and I – the band’s next gig is supposed to happen the same day I leave Saijo. To be honest there have been times lately when I wasn’t sure where my relationship with the other band members fell, but on this day I was truly happy to spend the entire day with them. I think all of us are a little bit different from the rest of the members of the jazz circle, though I don’t really know how to clearly define why. At any rate, on this day we all talked and joked around easily. I think our performance was also very smooth – definitely the best out of all the lives we’ve done. We all had worries due to our lack of practice time. We sat waiting for our turn to play with everyone saying, “I’m so nervous!” in some manner or another. However, playing turned out to be truly enjoyable. It was definitely a good way to go out. That was the kind of memory I wanted for our last live. Much to the surprise of the British vocalist and I, at the end of our performance one of the other members of the circle came out and announced that since it was our last live, we’d received flowers. I was honestly shocked and felt very happy. The card on the flowers was quite obviously Google translated, but perhaps that gave it a bit of charm. Who got them for us was a mystery for most of the day – our band members certainly didn’t know. In the end it was revealed that a professor who plays in one of the jazz groups got them for us. Though we’ve never exchanged words with him, apparently he also went to our previous live at the cafe. What a lovely gesture! That night was the last party I think I’ll be able to go to for the jazz circle. Though I talked only with those whose company I’ve come to enjoy, maybe that’s the best way to spend such a night. Knowing I won’t be able to appear in any more lives with these people made me sad. Sitting alone in my room today became unbearable, so I did what any good American does – get out of the house and drown my sorrows in pudding. Which, in Japan, resembles flan more than it does what we know as pudding. Pudding, flan… it actually does help. At the university there was a festival called Yukata Matsuri, with food stands and performances all day. As I’d very much enjoyed the School Festival near the beginning of the year, I knew that wearing a yukata would only up my excitement at this event. I slept the morning away and went in the afternoon. However, I would come to regret not having gone a little bit earlier. Apparently during the morning my Pokemon Rival from the beginning of the year was at the festival. If I’d gone, I might have been able to see him once again, but I probably won’t have that chance from now. When I found out he was there when I wasn’t I felt quite down. Earlier that day one of my friends told me, “You said you wanted to live every day without regrets, right?” I thought that moment was a prime example of me not listening to my own advice. In the end, however, I think living without regrets isn’t always going for it. I think part of it is realizing that you have no reason to regret something. Maybe it would have been nice to go in the morning, but not for that reason. If he didn’t bother to tell me he was going, why should I care? I should care about the people who say, “Don’t worry about him,” or follow me on my silly quest to play pool in yukata, or remember small details about me after a long time apart. The festival itself was quite crowded. The JLPT (Japanese Language Proficiency Test) had been held on the Hiroshima campus that day, leading to an influx of foreigners wandering around. Of course there were tons of students, and some people from the general area. The area of the festival itself only took up a fraction of campus, so everyone was crowded around food booths trying to get some of the delicious, fried festival foods. I think the people in our program were the only foreigners to wear yukata or 甚平 (jinbei). This gained a lot of stares and several people taking our pictures as they passed by. Most of the people complain about that kind of attention, but I always find it kind of interesting. I would never be stared at twice in America, but here I’m fascinating. I wonder if it’s bad to enjoy the limelight while it lasts? Almost all of our friends ended up congregating in one area. We took photos like we were in a photoshoot. I ate some of the most delicious takoyaki I’ve had here, bought from a kid who tried his very best to speak some English. I also sampled some of my friend’s チヂミ (chizimi), which is like the Korean version of okonomiyaki. All the while we could hear the a capella group performing on the nearby stage. I could hear the sound of one of our friends, a Korean guy with a very powerful voice. After the a capella group finished the dense crowd gathered around the stage started to shuffle. I regrouped with some of my friends and we pushed our way to a place where we could see. The next show up was a fashion show, and not only did I enjoy the one I’d seen the previous semester, but one of my friends was appearing in it. He’s just about one of the most beautiful people I’ve ever seen, so the moment we saw him prepare to go onstage my friend and I pulled out our cameras like paparazzi. After the fashion show was the Rhythmic Dance Circle, who are probably the most popular circle on campus. They do several kinds of dance, including hip-hop, break dancing, free-style, really anything modern that can be put to a heavy beat. They’re truly talented and tons of fun to watch. The influx of people when the circle came on was amazing. My friends and I all made sure to stay put so we wouldn’t lose our spots. 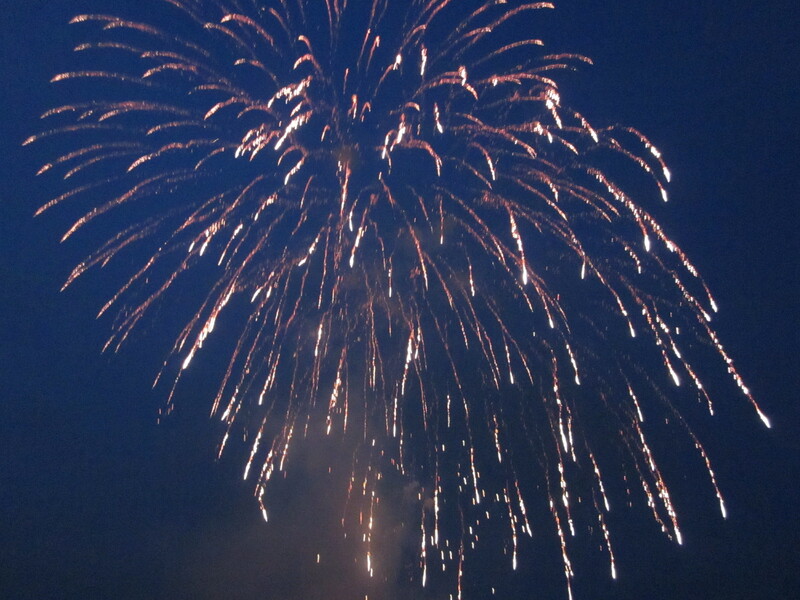 Finally, as the sky darkened around 8, there were fireworks. They only lasted a couple minutes, but they were still quite impressive. With a laugh I told everyone with me, “Happy early 4th of July!” The one British girl with us made a snide remark, naturally. After this there was debate about what to do next. I had my mind pretty set on what I wanted to do – my favorite bar was offering a discount if you were wearing yukata. 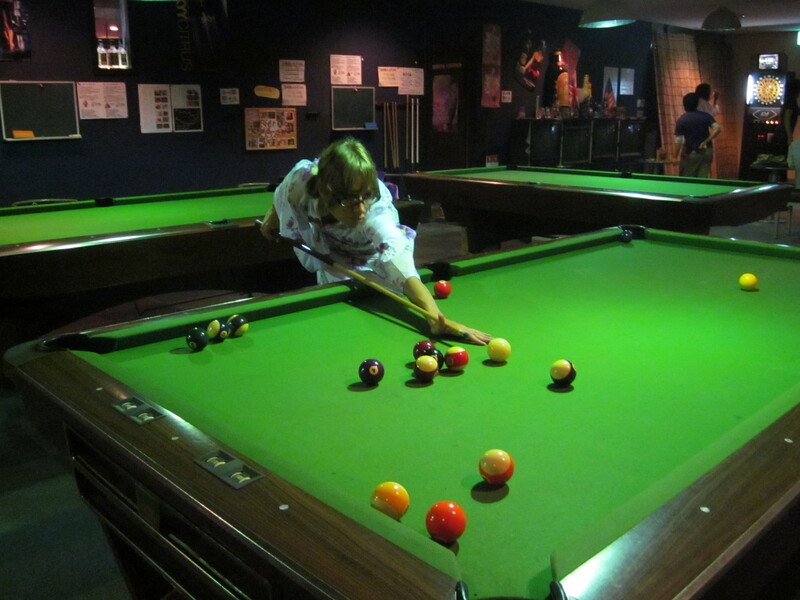 This coupled with the mental image of playing darts and pool in yukata was enough to convince me we should go. In the end most people were tired, so they returned to get some rest, particularly as it was a Sunday night. It was just three of us that went to take advantage of this discount. It was while playing pool that I learned I’d missed my Pokemon Rival at the festival. And as I mentioned, for a bit I felt down about it, but in the end I think I can get over it. The two friends I went with are always supportive, even if I do or say stupid things. The friend who works there is always doting to some extent, even if I break their darts machines (sorry). These are the kind of people I need – they’d tell me if they went to a festival. Actually, I’m going to miss these guys when I go back to America. I’m also going to miss those kinds of festivals. Time is running out, so I’m not going to sleep in and miss anything else!